"Cocoa ~ The Not So Magic Magician"
Cocoa is growing every day. Soon she won't be a puppy any more and I'm thinking that might be a good thing! The other day while I was doing dishes and she was laying underfoot once again, she got up and wandered into the dining area. 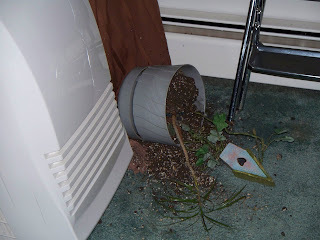 I did have a rather tall round table covered nicely with a floor length table cloth and sitting on top was a lovely plant that had been sent to me by a friend after my open heart surgery 6 years ago. It's a miracle that I kept it alive and thriving for that long. It WAS the only live plant in the house! 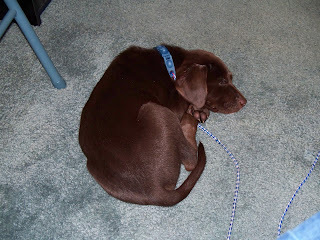 ........and this is Cocoa after I was done scolding her. As you can see, she wasn't terribly upset with the scolding she received. She promptly went to sleep and left me to clean up the damage! I hope this isn't going to be a "Marley and Me" type of happening. She doesn't seem to be catching on or at least she is leading me to think that she is not catching on! I really do think that she is highly intelligent and she is manipulating me! Prancer is taking an interest in her. Albeit, it may be an interest that is being forced upon her by Cocoa. Prancer plays with her now and shares her water bowl even though Cocoa thinks she needs to swim in it or wade through it. Prancer just looks at her as if to say "must you put your feet in here when I am trying to drink?" I keep hoping that Prancer will help train this unruly pup! 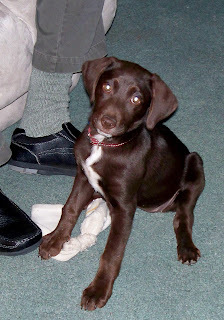 She has already let her know that she is the alpha female dog and Cocoa has been the recipient of several roll-overs and nips that have made her yipe. 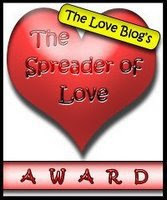 Mind you, she has deserved every chastising Prancer has doled out..........and many more that Prancer has let slide! She is learning........but I think she will be in the puppy stage for at least a year and a half no matter if she attains her full growth by then! But she has captivated our hearts and we wouldn't give her up for anything.........unless.......NO, I mustn't think that way. Here is a photo of her from two nights ago..........see how big she is getting! 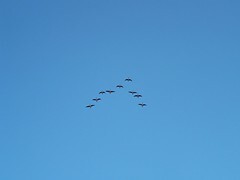 While driving to work the other morning, I spotted a formation of geese flying north. A sure sign that spring is on its way! As I travelled further down the road, I saw another group in the same 'v' formation heading in the same direction. There are other signs too. The maple trees in my backyard are beginning to bud. I haven't seen any growth of my flowers that come back every year, but I am sure they are just lying dormant, waiting for the mositure and sun to coax them into pointing their little heads up for all to see and rejoice in. It has been a very long, hard winter in Michigan, as well as elsewhere, I'm sure. And I imagine that every one of you is as anxious for spring to arrive as I am. I even heard one of our local meteorlogists say that he was tired of winter and ready for spring! It is beautiful outside today. The thermometer says it's only 43º out there but I was out sitting in just my jeans, shoes and sweater keeping an eye on Cocao and Prancer and it certainly felt warmer than that in the sun. In fact, I'm wondering what I am doing inside on such a nice day off? So I will end this and head back out to the great outdoors and enjoy it while I can!